In the heart of historic Paris Nestled between three of the most famous squares in Paris: Concorde, Vend�me and Madeleine, the Castille Paris benefits from an exceptional location in the heart of historic Paris at number 33 in the famous Rue Cambon. 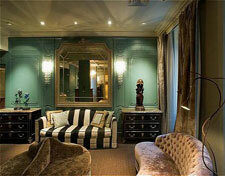 The present Rue Cambon was built in 1719, joining the Jardin des Tuileries to the great boulevards. At that time, typical large 18th century private residences surrounded large courtyards. In 1910 Coco Chanel established her first workshops, which are still there today, at number 31, thus gaining world-wide recognition for the street in the 20th century. The recent interior alterations made in 2005 and the collection of 18th and 19th century works of art give intimacy and elegance to this 18th century private residence which has consequently retained its original soul and charm. The 86 rooms and 21 duplex & suites, mostly overlooking the patio, offer either a traditional Venetian inspired atmosphere or an elegant contemporary atmosphere. The charm of the Castille Paris lies in its arrangement in two distinct wings, each offering a different atmosphere but both ensuring comfort and peace and quiet. The luminosity in the rooms and suites, the soft, restful colours, the sound insulation and air conditioning guarantee the most complete feeling of well-being throughout your stay.